HGTV’s Ellen’s Design Challenge is pretty awesome! Happy Friday! This week I watched the second episode of HGTV’s new show Ellen’s Design Challenge and I was so impressed by the talent! This show features several furniture designers all competing to win the title of Ellen’s design expert and $100,000. All of the designers have completely different styles and approaches toward furniture design, making for a very entertaining competition. The furniture is created in such a short amount of time (48 hours), yet is so unique and high quality. It’s really exciting to watch! The competition is only at its half way mark, so you still have time to catch this creative competition. This week designer Katie Stout took home the win with her bold and graphic wardrobe featuring mirrored sides. The judges were all pleasantly surprised to find that one of the mirrored panels pops out to reveal a cubby drawer. This piece is high on style and storage! I’m picking Katie as the show’s season winner, so let’s see what happens. Her designs have been artistic, functional, and most importantly, memorable. Take a look at Katie’s design from the first episode of Ellen’s Design Challenge (below). I just love the whimsy of this stylish storage solution, which was inspired by the sculptural bowl on top. I would totally put this in my own home!! If you’re impressed by this piece of furniture (above), wait until you see the limited materials that it was built with! 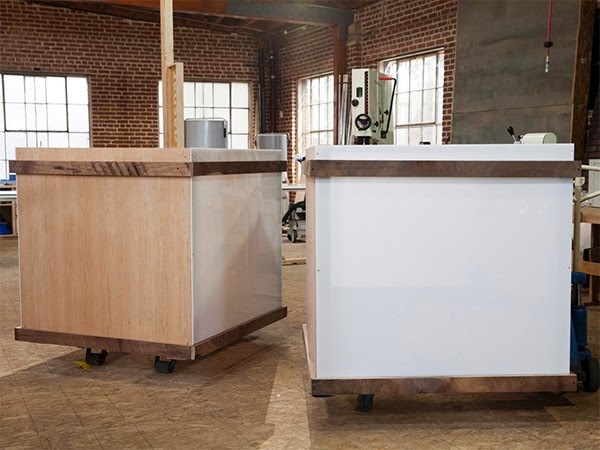 Designer Katie Sout’s bar cabinet (shown above) along with Designer Tim McClellan’s creation of a military campaign desk were both created – literally – out of this big, empty box below. 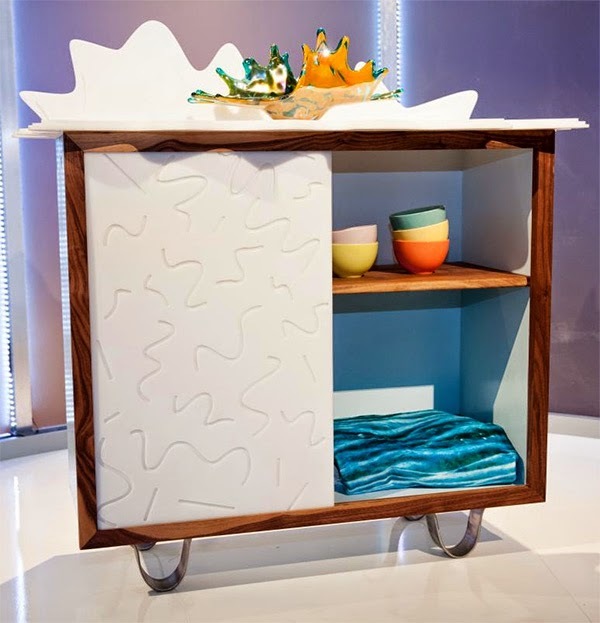 The designers all expected the boxes to be filled with materials, but this wood, steel, and plexi-glass box frame (below) are all the materials that were used for the furniture designs shown here. 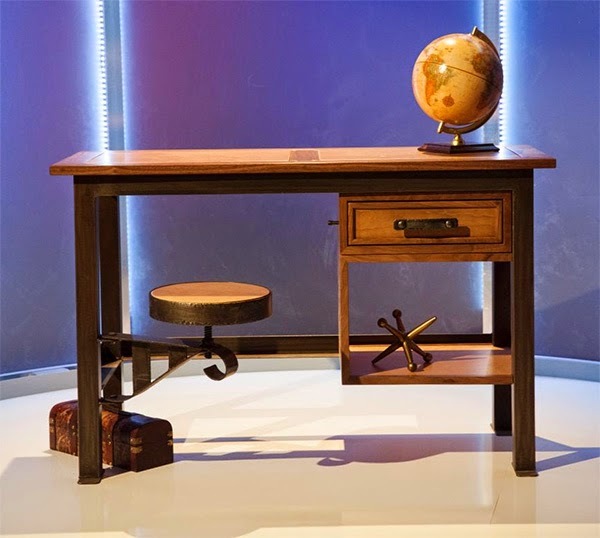 Just to get you caught up, Tim McClellan’s military campaign desk (shown below) was the project winner on the premiere episode of Ellen’s Design Challenge. The craftsmanship is impeccable, and the drawer shown pulls out to a carry around case with a handle, containing all of the drawer’s contents, just like traditionally used in wartime. If you’ve already been watching Ellen’s Design Challenge (EDC), who do you think will be the winner? I’d love to hear your vote! 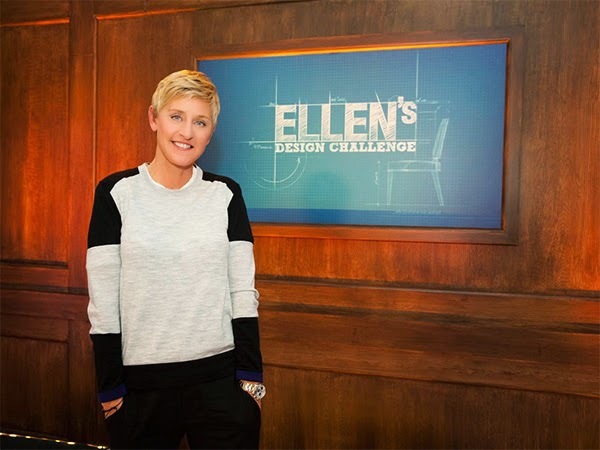 Check out Ellen’s Design Challenge on Monday nights at 9pm EST, 6pm PST on HGTV.